“Reach out and touch someone.” A Rocky Mountain Wood Tick sits poised atop a twig waiting for a warm-blooded host. A minor miracle this spring. I’ve hiked three notorious “tick” trails in the Rockies and returned without any of these annoying little critters crawling on my body or in my hair. The ticks we’re looking for at this time of year are the good old traditional Rocky Mountain Wood Ticks (Dermacentor andersoni). They’re pretty big (0.5 cm), eight-legged, and fairly easy to spot or feel if you take the time. 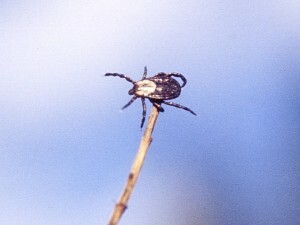 Wood ticks are the primary tick found in the Canadian mountain parks. While they have been associated with several diseases, tick paralysis is the only one common in Canada, especially when the tick attaches itself near the hairline on the back of the neck. I’ve found dozens of ticks crawling on me, on my clothes, legs, neck and hair, during my many years of hiking in the Rockies. The primary season of activity is spring (March through June) and usually on dry, rocky slopes. If it’s any consolation, I’ve never picked up a tick in a valley bottom or on more shaded, northerly-exposed slopes. Never in the upper subalpine or alpine regions. And I’ve never seen a tick after the end of June. Others may have had different experiences, but that’s just me. The list of trails in the Canadian Rockies where I’ve encountered ticks reads like a guide to best early season hikes—Castle Lookout, Muleshoe, C-Level Cirque, Aylmer Lookout, the Juniper Trail and other southwest-facing slopes above Canmore and the Columbia Valley. In fact, you will usually find wood ticks anywhere that mountain sheep are common. Out of all the wood ticks I’ve brought home with me, I’ve only had one that managed to attach itself. It was on the back of my shoulder, so I couldn’t reach it with tweezers (the correct removal method). No one was handy to do the job, so I drove to the local ER where the on-duty nurse gently removed it with tweezers. Since it was still amongst the living, I assume she shipped it off for testing. Talking about ticks is like talking about bears: you can go on forever. Anyone interested in an appreciation of wood and other western Canadian ticks can check out “Ticks and Humans” on the BC Govt website. And I’m not talking about the infamous deer tick (Ixodes pacificus), which is endemic to British Columbia’s southern valleys and the Lower Mainland. This tick is smaller than the wood tick and carries Lyme disease, which is nothing to chuckle about. No evidence that it has made its way into the mountain parks (yet), but you can read an enlightening article on the CBC News website “Lyme disease: Tiny tick, big problem”.